ABFO Membership is available through the local ABFO chapter closest to you. Bioscience/Biotechnology/Med Device companies can join ABFO. Primary and secondary representatives of member companies should hold senior financial positions, such as Chief Financial Officer, VP Finance, or equivalent. However, we welcome the participation of additional member company staff at ABFO activities and functions. ABFO International supports the regional chapters through the ABFO National Conference and also provides ongoing logistic and administrative support. 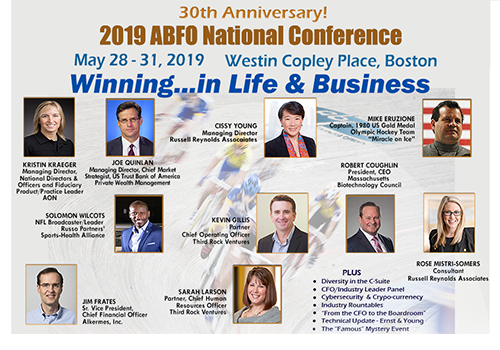 Our website also serves the membership by posting chapter information including upcoming events and open finance job postings at ABFO companies around the country. ABFO activities are open to members and their invited guests as this allows us to create the best environment for discussion of business and financial issues and also lets our members develop strong professional relationships among themselves. At the National Conference, as well as local chapter events, industry service people may be invited to participate in panel discussions and presentations. Their participation is limited to specific sessions so we can work to promote open discussion of issues relevant to bioscience financial officers without pressure from industry outsiders or service personnel. Limited to Bioscience/Biotechnology/MedTech/Med Device Companies. Senior financial people, such as Chief Financial Officer, Vice President, Finance, or Controller/Director level. ABFO member representatives serve at the pleasure of their member companies and can attend and participate in ABFO events. Service providers are not eligible for ABFO membership. Their attendance at ABFO events is subject to ABFO Board approval. Some chapters may charge a membership fee to cover costs associated with chapter activities. To apply for ABFO membership or if you have questions about us, please contact your local ABFO member representative, listed below, or Genie Hawkins, ABFO National Membership Coordinator at genie@norcalabfo.org. Northern California ABFO Chapter membership is $400 per calendar year for companies with less than 100 employees. For companies with 100 or more employees the cost is $600. For companies with 1000 or more employees the annual cost is $1,200. Companies new to ABFO are welcomed with a special rate of 50 percent of the listed dues for the first year. To apply for NorCal ABFO membership or if you have questions about ABFO, please contact our ABFO Membership Coordinator Genie Hawkins. Download an ABFO Membership Application HERE. To apply for membership in the Southern California Chapter or if you have questions about ABFO, please contact the ABFO Membership Chair. Download an ABFO SoCal Membership Application HERE.